Even as an adult, I find brushing my teeth to be the most annoying part of my self-care routine. Plus, there are so many ways to care for our teeth that I often find it overwhelming. I do the basics daily (brush and floss) but integrate other activities as much as possible without driving myself crazy (tongue scraping and oil pulling). I use a few different types of homemade DIY toothpaste recipes and most are just one ingredient with an added essential oil. There are no specific proportions to these one-ingredient toothpaste recipes… I usually just use enough to cover the bristles and add more if necessary. I also keep a jar of re-mineralizing toothpaste on-hand and follow this recipe minus the cinnamon and clove powder. My gums love it when I oil pull. I have super sensitive gums and they get irritated quite rapidly if I don’t oil pull for a while. 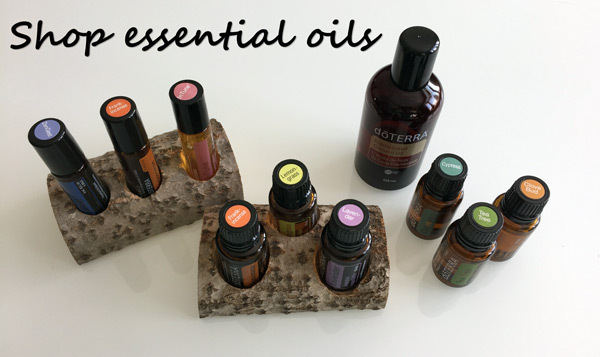 My favourite is to oil pull with coconut oil and one drop of an essential oil. How do you naturally care for your teeth? Anyone that know me well knows that I am the worst when it comes to a stuffy, sniffly nose. This past week was terrible, as I caught a bad cold right before the holidays. A few years back, I caved and decided to try this weird device called a neti pot. I hesitated at first… The process sounded kind of gross. Now after seeing the benefits, and on further thought, I love it and now think it’s kind of gross to not wash your nose. Don’t we wash the rest of ourselves? Neti pots are used for nasal saline irrigation which basically means you rinse your nose with salt water. Doing so helps thin and flush out mucus (yuck). You can buy a pre-made saline rinse or I started making my own of equal parts pure sea salt and baking soda (1/4 tsp each). Since introducing more essential oils into my life, I’ve been adding a drop of pure tea tree and/or lavender essential oil to my neti pot rinses every now and then. I have definitely noticed a difference in the effectiveness of the rinses. Another thing I do to help with the stuffiness and sniffles at night is to put a drop of essential oil on both bottom corners of my pillow (I turn around a lot). I normally use eucalyptus but this time I tried “easy air” and it worked even better for me. In fact, once the aroma wore off, I woke up in the middle of the night all stuffed up. I put a few more drops and fell right back asleep until morning. Easy air also works well in the diffuser. Obviously, I follow this routine when I am sick. However, I will sometimes do the neti pot as a preventive measure (i.e. after taking a flight or train ride or during allergy season). After switching to my DIY deodorant, I then revamped my skin care routine. The title of this post may seem deceiving because there are a lot of products in the picture, but it’s pretty basic. These are just various options I go through. I started my transition to natural skin care with the Oil Cleansing Method (OCM), which means I washed my face with oil (e.g. coconut, argan, castor, sweet almond oil – or a mixture!). This seemed counter-intuitive (and like an overall bad idea) considering I had oily skin. The first few days were rough – and I did break out – but my skin then regulated itself. On blemishes, I used a mixture of equal parts Apple Cider Vinegar (ACV) and water or tea tree essential oil. Over the years, I gradually moved away from daily OCM and am now mainly washing my face with water. If I wear make-up, exercise heavily or need extra moisturising in the winter, I will use the OCM or wash with diluted Dr. Bronner’s castile soap before going to bed. After washing my face, I moisturise with jojoba oil mixed with a few drop of helichrysum essential oil. Jojoba is currently my favourite oil for the face since it is similar to naturally-occurring sebum and does not clog pores (I’ve used coconut and argan oils in the past). Helichrysum has amazing skin benefits (you can also use frankincense or lavender). Oh, and the aloe vera plant in the picture is not just decor. I do, every once in a while, clip a piece of it and rub the gel on my face. About twice a week, I will use witch hazel as a toner on my t-zone. I also try to exfoliate once or twice a week with xylitol (which I grind to a finer texture) or baking soda (rubbing very gently since it can be irritating). I also treat myself to a weekly face mask. Remember, everyone is different… I recommend you test out a few options to see what works best for you. Also, please be patient. Your skin will need a bit of time to adjust to whatever new routine you introduce. The first step I took as I transitioned towards a natural, chemical-free lifestyle was to stop using store-bought deodorant and start making my own. I’ve been using this recipe for so long now, I honestly don’t even remember how I found it! It’s only three ingredients and you can customize the scent by using your favorite pure, high quality essential oil* – or a combination! Pour a small quantity of baking soda in your palm, about the size of a dime (or more, if necessary). Place one drop of essential oil (or combo) and mix with a sprinkle of water. Rub palms together to make a paste and then rub over armpit area. As this is not pre-mixed, you don’t have to worry about shelf life. It is good for as long as your baking soda and essential oils are good! I like to put baking soda in a small stainless steel container normally used for spices. This makes it easier to pour in my hand and store with my other self-care products. Some people might experience irritation from the baking soda. Always test on a small patch of skin before using. I only experience irritation if I shave my armpits right before applying the deodorant. To avoid this, I normally rub a pea-sized amount of coconut oil on my armpits prior to application. I love this recipe because I never have to “make” or buy pre-made deodorant. I just always make sure to have my favorite essentials oils and some baking soda on hand.